KrisKnits...: Mom Always Gives In..
We've been thinking about getting the kids a pet for awhile now. A dog would be a wonderful addition to the family. It's what we all want, but it's a bit too much at the moment. Especially If we're going to be moving soon. Victor is infatuated with the movie Finding Nemo. I'm sure other Mothers can relate as well. He'll watch it every night before bed. With this in mind we stopped in the pet store on the way home from food shopping the other day. After five seconds in the store he asked, "Mommy, can I have a fish, please?" I couldn't say no. He got to pick out the one he wanted and we brought "Nemo" home. 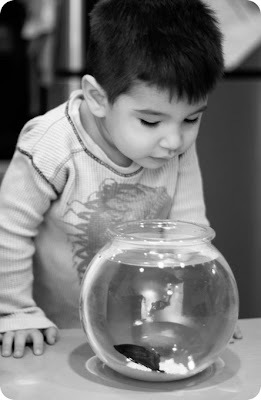 So far he's been a very responsible 2yr old, remembering to feed the fish everyday. He even helped me change the water this morning. It's truly amazing to watch my son becoming a boy before my very eyes. They both seem so pleased with the new family addition! 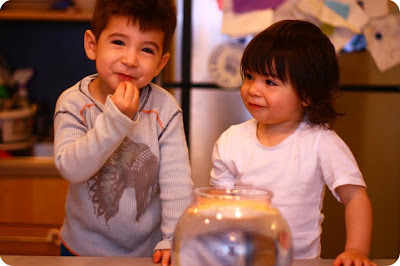 My 2 yr old has a Beta fish (we named Rainbow, cause of it being so colorful) too. It's so amazing how he wants to "watch nemo" and mean the fish bowl, not the TV. Aren't kids that age just soooooo adorable and you're right, you can watch them grow up right in front of your eyes. Would it not better to give the fish a bigger "house"? I think it is rather little.Here in Switzerland it is forbidden to put fishes in bowls. but perhaps you put it only for the foto! Sorry, but it hurts me a little! Greetings Claudine , sorry about my bad english! Someone who convinces you that there jnjjnd81 really is an unlocked door just waiting for you to open it.